All of his rustic scenes are full of observation and naturalness, executed in a manner which is less and less rugged, and a technique that gains in suppleness. The artist has now discovered his own easy and definitive way of expressing himself and appears in full possession of a subject, which he treats with ease and without weakness. He is the painter of the field worker and rustic landscapes, the theater of his work. In this genre, he shows a true vision of personages and of the things that surround them. Many artists during the latter half of the nineteenth century relied on imagery introduced by earlier generations of painters. 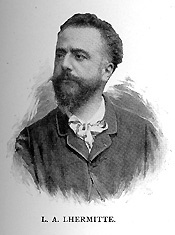 At the same time, however, these artists, such as Léon-Augustin Lhermitte, rejuvenated these older themes by executing them with progressive techniques. Lhermitte took the recognized imagery of the peasant and rural life and reintroduced it by using more contemporary media, such as pastels. For these innovations, Lhermitte was praised and admired by his contemporaries, such as Vincent Van Gogh who wrote that “If every month Le Monde Illustré published one of his compositions…it would be a great pleasure for me to be able to follow it. It is certain that for years I have not seen anything as beautiful as this scene by Lhermitte…I am too preoccupied by Lhermitte this evening to be able to talk of other things.” (quoted in Léon Lhermitte 1844-1925, ex. cat., Beverley Hills: New York: Galerie Michael; Altman/Burke Fine Art, 1989, unpaginated) Admired by contemporaries and modern audiences alike, Lhermitte brought the image of rural life and landscape into the twentieth century. Léon-Augustin Lhermitte was born on July 31, 1844 in Mont-Saint-Père in the Aisne region of north-eastern France. His earliest experience with the arts was copying works out of popular illustrated magazines and studying the work of earlier French painters, such as the Realists. His father, a schoolteacher, encouraged his work by allowing him to sketch. The young Lhermitte’s talent quickly became apparent to others. His father introduced his drawings to Count Walewski, then minister at the École des Beaux-Arts. Walewski was so impressed by the young mans’ abilities that he offered him a scholarship of 600 francs permitting him to enroll in the École Impériale de Dessin in the early 1860s, where he became a student of Horace Lecoq de Boisboudran. Here he was introduced to a type of study of drawing that was based on memorization, a technique also used by James McNeill Whistler. In this way he could view a scene, especially a landscape scene, and more fully execute the painting back in his studio. After attending the École Impériale he moved to Paris and began living with his friends and entered the École des Beaux-Arts, in just enough time to be able to attend the 1863 Salon des Refusés. During his studies at the École des Beaux-Arts he must have gained extensive training in painting, but for his debut at the Salon he recalled his earliest training at the École de Dessin and exhibited a charcoal drawing entitled Les Bords de la Marne près Alfort (The Banks of the Marne near Alfort). He earned his first medal, third-class, at the Salon in 1874 with Le Benedicite (The Benedictine), Le Bateau (The Boat), Une Rue de Saint-Cyr (A Road in Saint-Cyr). This same year Lhermitte spent s everal months in Brittany where he became fascinated with Breton culture; their costumes, their activities, their celebrations, the colorful nature of their life. Throughout the next five years he returned to this region on several occasions and exhibited more scenes from Breton life. As a regular exhibitor at the Salon, Lhermitte’s graphic work had become increasingly sought after, though he had not yet attained the level of success that he desired. 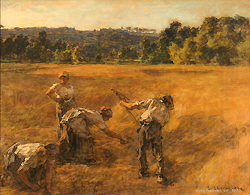 He wanted to complete a work that would solidify his success – this would be his 1882 Salon entry entitled La Paye des Moissonneurs (Paying of the Harvesters), an oil painting whose positive reception allowed Lhermitte to gain many lucrative commissions. The work was eventually purchased by the state and hung in the Luxembourg museum before being transferred to the Hotel de Ville at Chateau-Thierry. It is also the work that established Lhermitte as a member of the Naturalist tradition, because of the rugged accuracy of the presentation and the uncompromising view of rural life. …to Lhermitte, rustic activity embodied dignity, for he believed workers in the fields seldom complained…Bolstering these ways of representing workers were the locales in which Lhermitte places his figures. The countryside was seldom dour or depressing, the atmosphere often appeared light and airy…and the environment seemed spacious. In his image of rustic life, Lhermitte focused not only on peasant life in the fields, for which he earned the title, “the singer of wheat,” but also on interior scenes of peasant life at home, infused with the interior detailing and emphasis on light effects in his scenes. He also became a devoted depicter of mother and child, an emotional theme that showed Lhermitte’s sensitivity to the issues of family and relationships. His interest in femininity also extended to peasant women washing their clothes along the river basin, especially along the Marne. In these cases, Lhermitte combined each of his interests to create his compositions. He continued to exhibit these types of images at the annual Parisian salon held by the Société des Artistes Français but soon, around 1890, changed directions and began showing instead at the Salon for the Société Nationale des Beaux-Arts, to which he was named a “Sociétaire.” The Société Nationale was comprised of a group of artists who sought to provide other artists a less prohibitive exhibition embracing all the arts and more avant-garde themes and styles. Lhermitte, while treating subjects that found a sympathetic audience, quickly fell under the influence of the Impressionist group and began using a light palette and treating atmospheric effects which linked him to this progressive movement and thus more progressive exhibitions such as these.& nbsp; At the same time, his work was already more readily accepted by the Salon jury and audiences than these other Impressionists since his work did not challenge their preconceived notions of art. Lhermitte used progressive stylistic treatments, but relied on imagery in the vein of previous Realists to establish himself as an artist of dual nature, in this ever-changing period of French art. Even though his public success was secured by exhibiting and oil painting, Lhermitte was clearly and most importantly an accomplished draughtsman who excelled at the use of charcoal and pastel, among other media. His pastels are part of the growing use of pastels in France in the latter half of the nineteenth century, used especially well by the Impressionist group. Lhermitte was said to have begun experimenting in pastels in 1885, just one year before he exhibited for the first time at the Société des Pastellistes Français held at the Georges Petit gallery in Paris. Here he submitted a dozen pastels which depicted daily life in the areas of Mont-Saint-Père and also his travel to Vittel, Berneval, Laren, and Wissant. Lhermitte was one of the most important proponents for acceptance of the pastel. He continually exhibited his work at these exhibitions and helped forge a new group, that of the pastellistes, where he became a mentor for younger artists. His pastels were so successful that he almost abandoned charcoal drawing. His earliest strictly commercial associations were products of his success with his grasp of such diverse media. He established a strong presence in England after traveling there for the first time in 1869 and then again after the Commune of 1871. The art dealer Durand-Ruel, who supported some of the most progressive artists of the period, purchased several of his charcoal drawings and invited him to participate in his upcoming “Black and White” exhibition. Lhermitte consented and found great success and also a large British clientele eager to acquire his works. During his lifetime Lhermitte was very highly regarded in Anglo-Saxon countries where the picturesque and the healthy values celebrated in his painting and pastels were particularly appreciated. Values of work and family appear frequently in his work. Like Jules Breton and Rosa Bonheur, Lhermitte was appreciated because he represented the “good old days.” …Throughout his life Lhermitte pointedly ignored the Industrial Revolution, fixing instead on the image of society before its disappearance, the vision of a paradise lost for the citizens of big cities, of a time frozen outside the march of history. As he grew older, Lhermitte stayed closer to his home and executed several landscape pastels based on the banks of the Marne, which was near his studio, and other landscapes near his home. He was decorated with several honors from across Europe, such as the Chevalier of the Order of St. Michael in Germany, and his works were regularly acquired by the state after their showing. His life and career ended on July 28, 1925 in Paris, after which point his career and work fell into the oblivion until the 1990s when it was reappraised by an exposition at the Musée d’Orsay. Léon-Augustin Lhermitte balanced his progressive style with an imagery steeped in prior traditions of rural life and landscape painting, themes which he carried through into the twentieth century. To fully gauge his importance for nineteenth century art it is necessary to look to not just his oil paintings, but more so to his work of other media, especially charcoal and pastel drawings in which his abilities were put to fullest use.